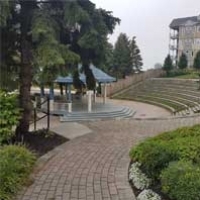 Most commonly known as the home of the St. Lawrence Shakespeare Festival, the Kinsmen Amphitheatre plays host to a variety of uses and events. Throughout the busy summer season, you can attend a Sunday Night Concert Series performance at the Amphitheatre or take a stroll through the Shakespearean Gardens; located in and around the venue. As the Amphitheatre is rentable, you can also host or take part in a wedding or other private function. With its riverfront location, connecting to the harbour and the Waterfront Trail, the Kinsmen Amphitheatre makes for an ideal venue for any occasion.